"Picks and prospects will prove to be valuable commodities leading up to the NHL trade deadline. GMs of teams that emerge as buyers (seemingly the vast majority of the league) might have to dangle key assets to land the perceived difference making players they desire in their quest to hoist hockey’s Holy Grail." “He is first and foremost, a goal-scorer. The Swedish sniper possesses high-end hockey instincts, able to create his own chances. Augmenting his pro-calibre shot is his speed and skating. Collberg is seemingly effortless out of the blocks and has very good top end speed. He is also quite agile on his skates. The Oilers may have to part with one of their Twin Tower Martins on Defense, leaving Marincin in the fold, to strength the squad to truly contend for a playoff spot in the NHL’s wild, wild, Western Conference. Koko was almost a Calgary Flame. Almost. “Known as a feisty power forward for the 39-23-2-4 Storm this season, Kosmachuk has led the team in scoring with 65 points in 68 games – including a team high 35 goals. Not to mention his 105 penalty minutes and plus three rating, Kosmachuk continues to improve steadily and consistently. In his third full season in Guelph, the nineteen year old Toronto native has seen his production rise from 21 points in 68 games in 2010-11 to 59 points in 67 points in 2011-12 to this year’s total of 65 points in 68 games. If the Leafs go after a netminder, Sparks may be part of the compensation going the other direction. The Leafs liked him enough to have recently signed him to an entry level contract. If it’s Mikka Kiprusoff the Leafs end up persuading to join them, then the Calgary Flames will likely ask for a different type of return given the abundance of goalies now in the system. St. Croix (son of former NHL goalie Rick) was a potential 4th round steal. For the record, I had the talented center rated as a 2nd rounder his draft year. The knock on him is that he does all his best work on the perimeter, electing to rarely get in the greasy areas. The Red Wings would also like to add a superior puckmoving defenseman. They were unable or uninterested (or uninterested in the asking price and salary) in landing Jay Bouwmeester from the Calgary Flames. Mark Streit’s name keeps arising, but the New York Islanders find themselves in the rare fight for a playoff slot. Bluechip blueline prospect Brendan Smith is reportedly and understandably unavailable. The emergence of forward prospects Tomas Jurco, Teemu Pulkkinen and Gustav Nyquist could very well make Tomas Tatar available. Tatar was a star back at the 2009 World Juniors, finishing tied for 4th in scoring, for Slovakia and has continued to make progress in the AHL. 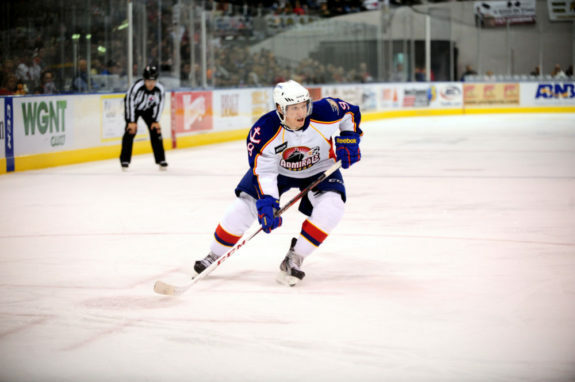 Vatanen has notched an impressive 43 points in 56 games for the AHL’s Norfolk Admirals. I’ll end off with admittedly a bit of a cop out as we do not yet know what prospect this pick will end up being. What I can tell you is that this is a very good draft class and the team that supplies the Blue Jackets with some temporary offensive fire power will be getting an opportunity to draft a key future asset. If Ben Bishop is not moved by the Ottawa Senators, maybe Robin Lehner is. It remains to be seen if any of the above assets will get moved on or before the 2013 NHL Trade Deadline, but even in a lockout shortened season there is no shortage of speculation and intrigue. Feel free to add to the list in the comments section below or elaborate upon why you think the above prospects or pick will or will not be shipped off for a hopeful final piece to a team’s playoffs aspirations. The full article was originally published at The Hockey Writers - read the full article here.